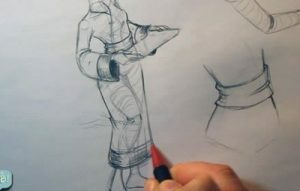 [/vc_column_text][/vc_column][/vc_row][vc_row][vc_column width=”1/1″][vc_column_text]Because this is going to be a robe the left side is going to fold over the right at the neck. 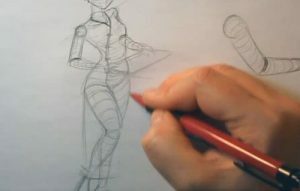 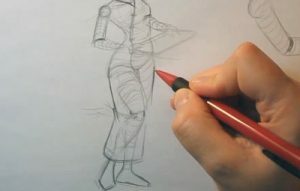 [/vc_column_text][/vc_column][/vc_row][vc_row][vc_column width=”1/1″][vc_column_text]When learning how to draw a Geisha, the key areas to focus on are: the knee, elbow pelvis and armpit. 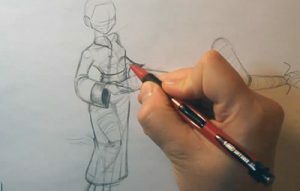 Draw in some cuffs at the end of the sleeves and a decorative band at the bottom of the dress to finish off this lesson. 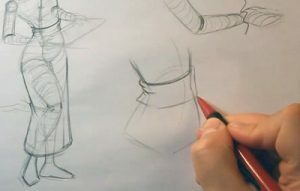 [/vc_column_text][/vc_column][/vc_row][vc_row][vc_column width=”1/1″][vc_column_text]When you are doing your own drawings, don’t be afraid to take a moment to do a few exploratory sketches to get a look that you feel is right for what you’re trying to make.